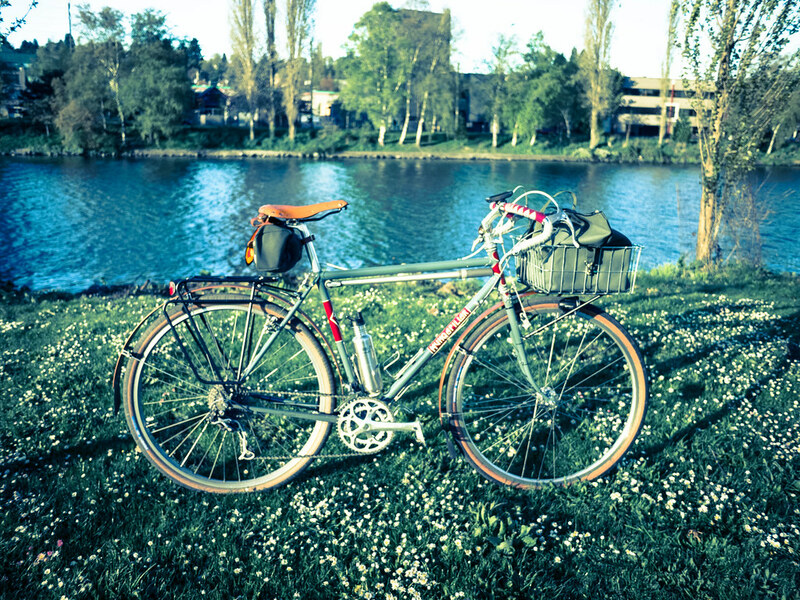 My company, Comcast Technology Solutions, made the local Seattle bike blog news! Good stuff – it’s heartening to encourage folks to get out on a bike even after Seattle’s record breaking rain this year (45 inches since October). I’m proud to work for a company that encourages folks to ride, and not worry too much about coming in wet, late, messy. We have happy folks who ride! If you want to succeed in biking to work regularly, you have to get through the first month. If your commute is more than a few miles, you may want to start out small and work up. I generally ride 4-5 days a week these days, but when I started out, I did one day a week until that felt ok. Then I stepped it up to two days. After a few weeks of this I went to three, and so on. You will be frustrated at first by lack of energy, weather, bad drivers, bad bikers, etc… After a month, though, you may find that getting in a car is actually more frustrating, and you may find exhilaration in anticipating a nice ride in, or home. There will be days where you hear wind and rain and think “what the hell am I doing riding in this?”, but when you get out in it, it’s not really that bad. Same as skiing – water or snow. You will get wet and/or cold, but you’re still having fun. 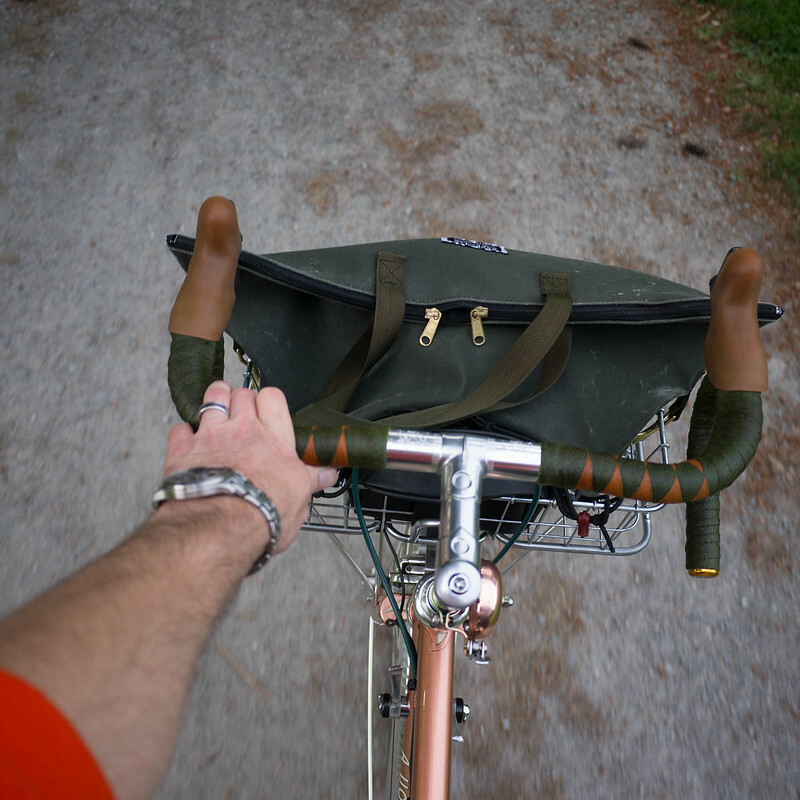 You will need to plan a tiny bit more to be a bike commuter – time, clothes, shower are all slightly modified. First off, it takes longer to bike to work (usually). Figure out how much time it takes on a day when you don’t have to be somewhere, or just give yourself way too much time. 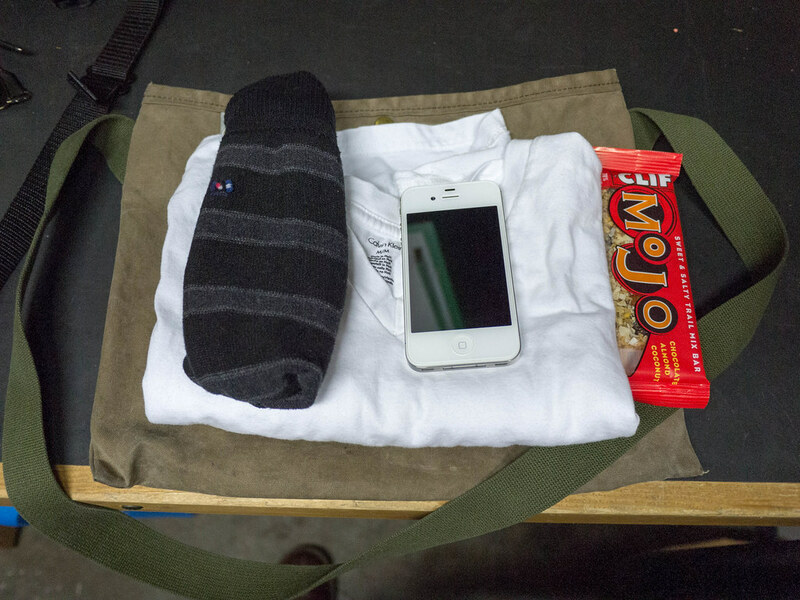 Keep your main clothes at work. I just bring an undershirt and socks with me. I take a shower before I leave. It’s generally cool in the morning, so I don’t break too much of a sweat on the way in. Nothing a good towel won’t take care of. I keep a week’s worth of pants and 2-weeks worth of shirts in the office. I launder these at a dry cleaner, but have brought bundles home via car/bus on my rest days. Remember – if you’re in an office job, you can generally get multiple wears out of a set of clothes between washes. I have 3 or 4 routes I take regularly. There is the short-direct shot into work; the meandering coffee shop route; the long scenic route; the mostly trail route. It really helps to have options as it makes the trips fun, and not tedious. 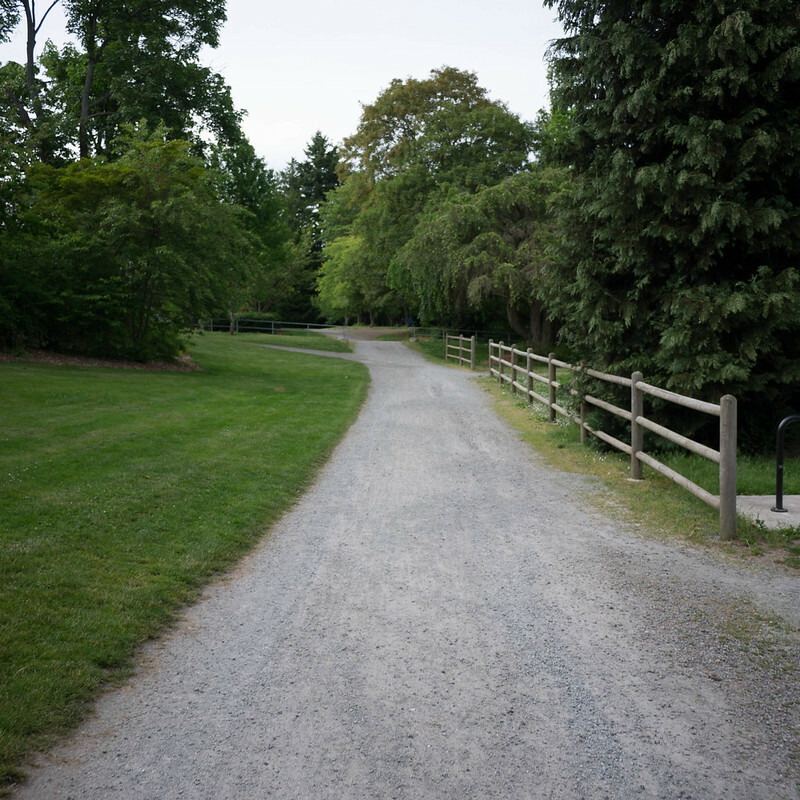 If you don’t like your route, take a different option, and don’t worry if it adds miles. My shortest route is 7.5 miles, and the longest route is over 13 miles one way. I can be just as tired after either of them, and all of them get me where I’m going. There is nothing quite as satisfying as passing a lot of traffic that is gridlocked due to a game or other random event. On a bike you have endless options! I hope this helps – commuting by bike is really rewarding in health, stress-relief, and giving you time to think or wind down on the way home. It is a great way to turn a stressful activity on its head, and get something beneficial out of the time you may be spending in traffic. I tried to commute at least 4 times a week this month as I’m captaining one of my small company’s two teams (the Cranksters). This is a bit more than I usually pull off, so I ended up with about 350 miles for the month. On a normal month of commuting, I’ll do 175 to 225 or so, and can sustain that throughout the year without feeling too spent. Ending this month today, I feel pretty good. The elbows a a bit sore, but that’s me getting older and less flexible. At this point, I feel that the rando rides have helped me figure out fueling, so on my prior years of doing about 300 miles in May, I was much more spent by the end of the month. I enjoyed a lot of good weather this year, and feel extremely lucky to have been able to ride as much as I have. Here are some pictures from my favorite part of the ride home. 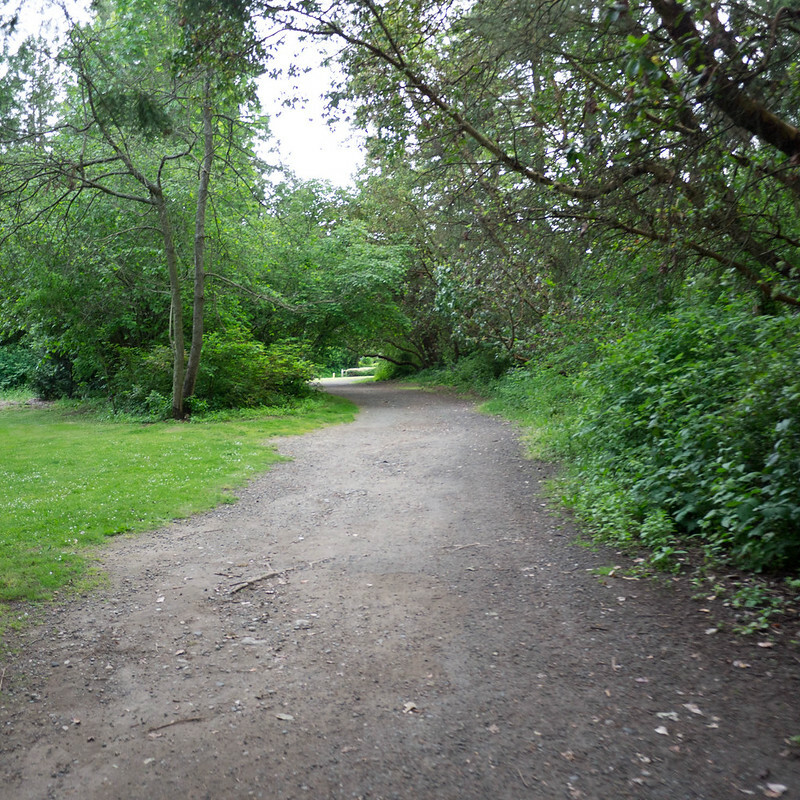 I go through a short half-mile gravel path up the “ravine” in Ravenna. It is a park that follows the contour of an old stream, and is usually a nice cool oasis in the summer months with relatively few folks hanging around. The path here has always been well maintained, and I often see city works trucks taking care of things on the morning rides. 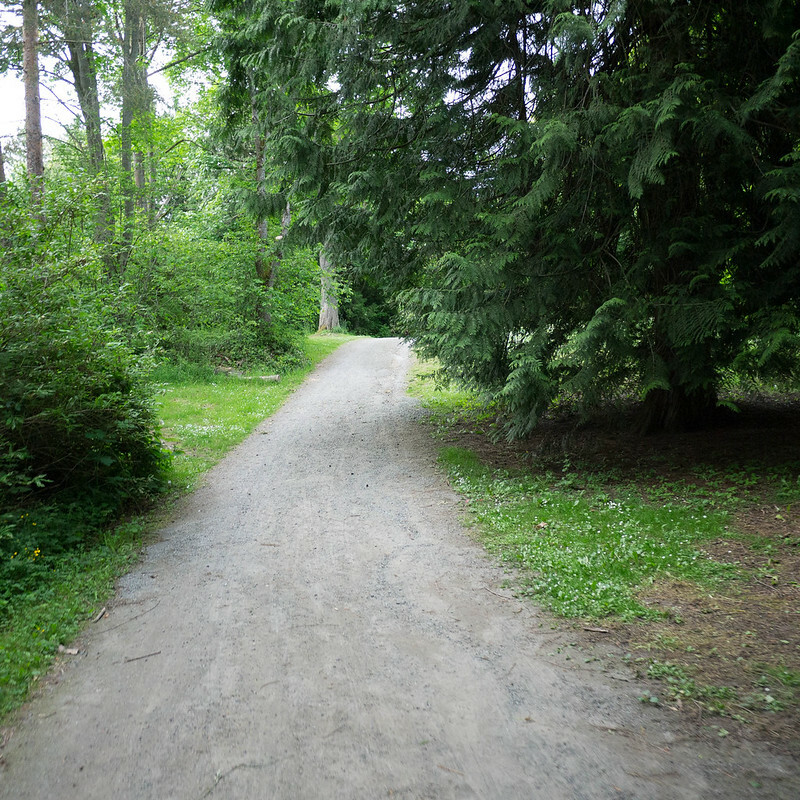 There are a few runners on this path in the morning, but I usually have it all to myself on the way home – even during rush hour. Most bikers seem to take the street that parallels the park. This way is much more scenic, cool, and interesting. I love this section as it is shaded by a huge cedar. It gets a bit washed out in the winter months, but nothing too scary. This is the last “scenic” part of the ride home before I’m back on the city streets. 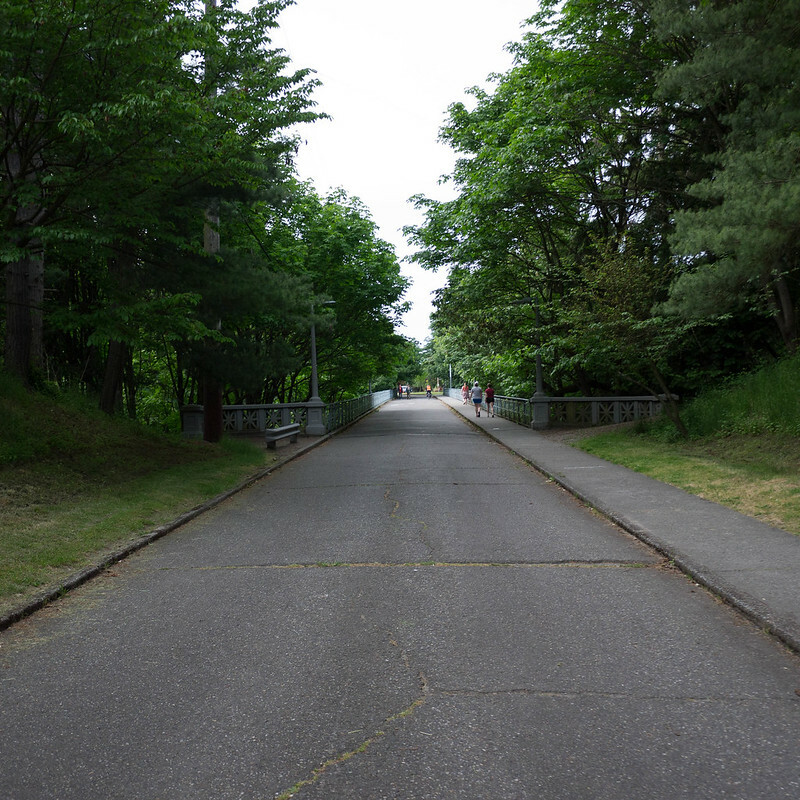 It is an old bridge that has been rendered bike and pedestrian limited – no cars allowed. How great would it be if we had this kind of infrastructure elsewhere! On a nice day at sunset, this is a great place for photos of clouds and tree canopy. Spring and Fall are beautiful!